Charming checkerboard floors adorned vintage kitchens in homes ranging from modest to grand. A black-and-white checkerboard floor was the most common, but occasionally you'll see old checkerboard floors featuring gray, red, or cobalt blue. If your vintage kitchen still has a checkerboard floor, don't replace it. If you don't have one, get this vintage look with a reproduction tile that looks like old. Long before paint manufacturers came up with washable kitchen paint, homeowners installed tile to protect kitchen walls from splashes and spills. The coverage varied; installation ranged from just the lower third to the entire wall surface. The contrasting borders frequently used were a decorative bonus. Ceramic tile rarely survives being ripped out, so a stash of new old stock is your best bet for an authentic look if your walls aren't already tiled. If you can't find that, opt for new wall tile that's designed to look old. Study old kitchen photos so you can duplicate the tile color, shape, and size. Built-in china cabinets were fairly common in vintage kitchens—and not just in luxury homes. We've lived in three relatively modest 1920's apartments that still had them. And, when the kitchen didn't have them, sometimes the dining room or butler's pantry did. The built-in cabinetry in the photo is marvelously intact, but it's a shame the door pulls were replaced. Though they're covered in paint, at least the hinges are original. Some built-in china cabinets undoubtedly went to the landfill when the homeowners remodeled. Fortunately, lots were salvaged as well. We've seen them at flea markets, reuse stores, and thrift shops. If you don't find what you need at any of those, your best bet is an architectural salvage shop. Installing an old drainboard sink—one that features built-in drainboards on one or both sides —in the kitchen is a wonderful way to give a new home a little vintage charm. Drainboard sinks are bigger than most of today's reproduction farmhouse sinks, but they do have the same exposed front aprons. They're usually wall mounted, with or without decorative front legs. But, occasionally, you'll see them installed on a cabinet base that shares the sink's width. Look for vintage drainboard sinks at the same places you search for old cabinetry: thrift shops, flea markets, and reuse stores. Also, check Craigslist and your local newspaper classifieds for drainboard sinks for sale, or for a salvage yard that deals in old fixtures. If you've ever read Harriet the Spy or The Spiderwick Chronicles, you know dumbwaiters are little elevators for your stuff. You'll occasionally find them in large, older homes with multiple stories; the basement counts as a floor. We're always amazed when someone rips out an old manual dumbwaiter to modernize the kitchen—or to gain a few more inches of cabinet space. If the latter is the reason, you have too much stuff. Leave the dumbwaiter intact. If you can't find an old dumbwaiter, and it is hard, look for a manually operated reproduction with vintage styling. And, make sure you warn the kids not to take it for a ride. Built-in ironing boards that fold down from their own slender, recessed cabinets were common features in vintage kitchens. Unless they were grand, most old homes weren't constructed with separate rooms for tending linens and clothes. If you have a built-in ironing board, don't rip it out when you add a laundry room. Remove the ironing board—don't toss it; save it for the next resident—and install shelves in the shallow recess. An ironing board cabinet works wonderfully as a space for storing spices. They don't get lost as they do in deeper cabinets. 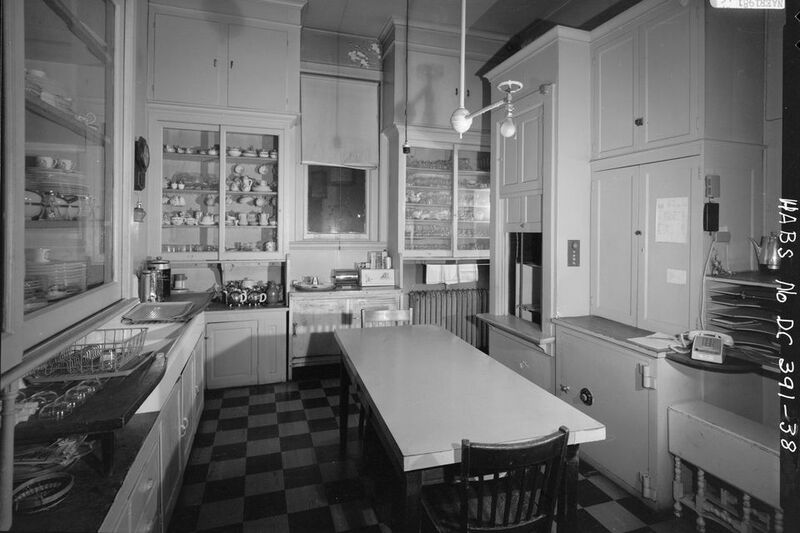 For casual dining, vintage kitchens sometimes sported space-saving, built-in banquettes. You frequently find them on the plans for kit homes offered during the first few decades of the 20th century. If you're creating a vintage-inspired kitchen or trying to return your old home to its original state, ask your cabinet maker to construct something similar based on illustrations from old plans—even if they aren't the plans for your home. If you can't find one of the original tables lurking at a flea market or antique mall, ask him to build the table too. The first time we read about someone ripping out a butler's pantry to enlarge a kitchen, we thought we must have misunderstood. It's bad enough that previous generations frequently took over the butler's pantry when they wanted a second bath. We may be obsessed with open floor plans now, but someday soon we predict homeowners will once again crave privacy and separation. Then, the latest thing will be a butler's pantry; they'll just give it a trendy new name. Butler's pantries are marvelous spaces. Frequently sandwiched between the kitchen and formal dining room, they provide a buffer between guests and the inevitable kitchen mess. Who wants to clean while they're trying to entertain? Butler's pantries usually have banks of built-in cabinetry to house dinnerware used in the dining room. In grand homes, the butler's pantry may also have a dumbwaiter, a small sink, a desk, and a silver safe.